This sounds like a scene involving Chevy Chase at a backwoods diner from a National Lampoon movie titled Dixieland Road Trip, but unfortunately this was no Hollywood horror: A Virginia woman who tried having dinner at an outpost of LongHorn Steakhouse in Fredericksburg, Virginia, was bitten by a poisonous snake that had slithered into the restaurant, then she got to spend the better part of a week in the hospital regretting her choice for dinner. Rachel Myrick tells local paper Free Lance-Star that she picked that location for an easy bite earlier this month with her boyfriend and son. They were casually strolling in through the restaurant’s foyer when she suddenly felt a sharp stabbing pain in her left foot. 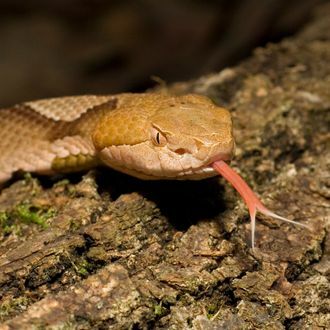 Her initial thought: “It felt like I was stung by a bee or hornet or something.” Then she looked down, and watched a copperhead sink its teeth into her foot two more times. The snake stayed latched on until Myrick shook it loose. She says the pain was “excruciating,” and recalls screaming out, “I got bit! I got bit!” The snake was only abut eight inches long, and Myrick’s boyfriend says he just flattened the thing with his shoe. He then suggested they call 911. Myrick spent the next five-and-a-half days with a foot swollen up about twice in size. Doctors gave her antivenin, Benadryl, and meds for nausea, and she was released from the hospital this past Sunday, according to WTVR. The swelling went past her knee, all the way up to her thigh and hip. She’s still on crutches, and it’s supposed to take about three months for her to fully recover.